There’s a new dessert trend that has been making waves for a while for the ice cream world. It is the Thai rolled ice cream which is also known as stir-fried ice cream. This famous Asian dessert is uniquely made by way of being rolled tightly to be serve with the addition of optional toppings. Being that I am a huge fan of ice cream, I wanted to share this concept that has become so loved by all ice cream lovers. The trend debuted in New York last summer and while many have thought of it as a fad it has continued to flourish as many still find this particular type of ice cream to be fascinating. More ice cream shops that specialize in this Thais creation are opening and more people are learning about this trend, they want to try this treat that has been so widely discussed and raved about. I had the pleasure of trying this specific ice cream and it is absolutely delicious, the concept of being rolled changes the way the ice cream is consumed which enhances the eating experience. 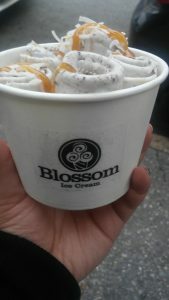 I went to Blossom Ice Cream which is located relatively close to the college, it was a great experience and the place is so quaint that you can almost miss it if you do not keep your eyes peeled for it. The ice cream is mostly known for the way that it is created as it is a truly intricate process. In order to make the rolled ice cream, they use a frozen slab of metal called a teppan. Then, a mixture of milk and either fruit, nuts, or other ingredients are added together before being poured onto the slab. The mixture is chopped, stirred, and spread out as it slowly crystallizes so it can have a creamy texture. As it becomes frozen enough, it is then slowly rolled with the help of a utensil then it is stuffed in rows in a serving cup when toppings can be added. But the ice cream must be rolled at the correct time or it will become too frozen and will not be able to be rolled correctly. Comment below on some great desserts that you have had the chance to try over this past summer.